Looking for an Amazon Redshift client? TeamSQL is now DataRow. The world's first and the only query and management tool built for Amazon Redshift. 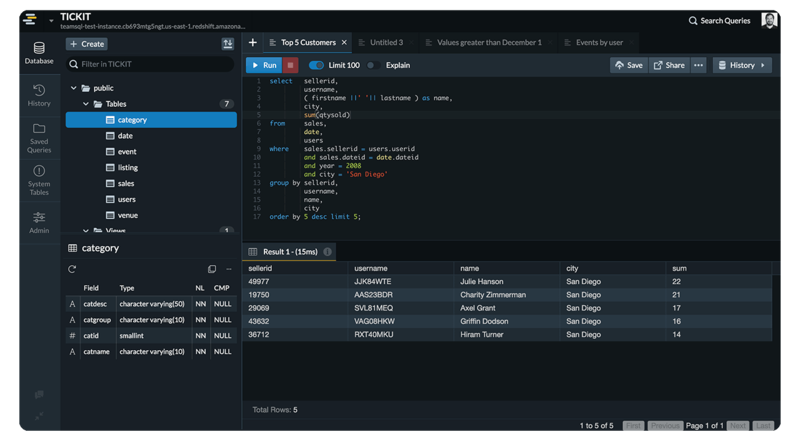 TeamSQL has been a great platform to experiment with modern UI and powerful features to help you manage your popular databases with collaborative features. Over two years later after launching TeamSQL in 2016, we've learned a lot about how to make database management better. As we look to the future, we want to take a more focused approach that will help us bring the best database management experience. As a result, we’re planning to rebrand TeamSQL as DataRow, starting with focusing on Amazon Redshift and say goodbye to TeamSQL. All TeamSQL services will be shut down on February 27, 2019 (00:00 UTC). We introduced the beta of new DataRow to our Amazon Redshift users in January this year, and now it is publicly available to everyone. DataRow comes with new features, which helps you work faster. Visit DataRow's website at DataRow to learn more about how the features in DataRow can help you manage your Amazon Redshift better. We are always here to help you switch from TeamSQL to the new DataRow with ease. Please contact us at contact us if you have any questions. See you there. TeamSQL, Inc. ("us", "we", or "our") operates the https://teamsql.io website (the "Service"). TeamSQL, Inc. will also retain Usage Data for internal analysis purposes. Usage Data is generally retained for a shorter period of time, except when this data is used to strengthen the security or to improve the functionality of our Service, or we are legally obligated to retain this data for longer time periods. Under certain circumstances, TeamSQL, Inc. may be required to disclose your Personal Data if required to do so by law or in response to valid requests by public authorities (e.g. a court or a government agency). To protect and defend the rights or property of TeamSQL, Inc.
TeamSQL, Inc. aims to take reasonable steps to allow you to correct, amend, delete, or limit the use of your Personal Data. You have the right to data portability for the information you provide to TeamSQL, Inc. You can request to obtain a copy of your Personal Data in a commonly used electronic format so that you can manage and move it.